This choice was partly from me and partly Tami. She was casting around for ideas and I suggested a muffin, because it fitted in with her new project and because I don’t bake enough and need prodding. I’m not confident enough to freewheel when it comes to baking, so I cast around the internet for ideas. I was partly thinking that I’d do some version of the cornbread in Veganomicon, because I know I like it, and I found that someone else had already done it. I added in some bacon bits and smoked paprika to the dry mix, but something went wrong because the mix was not at all the right texture going into the oven. It was much too firm but I couldn’t add more liquid because the polenta had absorbed the rest and was a lump. I didn’t have any more ingredients so I put them in the oven anyway. 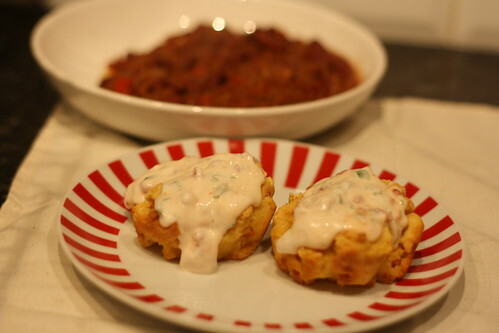 I was quite prepared to throw them away and started to look around for something else to serve with the chilli, but they came out not as badly as I’d feared – not a soft moist muffin, more like a rock cake, but edible with a faint hint of smokiness. I wish I’d stuck with my initial preference and done a version of the corn muffins from Vegan Bakesale, but I live with a corn hater. For the frosting, I used sour cream which I flavoured with chopped green onion ends, hot sauce, agave and a few more bacon bits. It was loose so I just drizzled it on top. The chilli in the background is from Vegan Diner. I hadn’t made this version before and I liked it. It went from a pile of ingredients to being dished up in about 20 minutes, and was a nice tasty dish to serve up with the rock cakes muffins. This entry was posted in Food Network Friday, Vegan Bakesale, Vegan Diner, Veganomicon by efcliz. Bookmark the permalink. I had a lot more fun doing the write-up on this than I did sampling them. Next time, go with your gut on cornbread stuff. I know what you mean about baking. I feel the same way and it is difficult in a house full of sweet- tooth people. Great job and wonderful tenacity!